We live in Colorado so we have the wonderful mountains to enjoy during the winter months. My kids snowboard and we always have a wonderful time as a family hitting the slopes. It is a great family sport that we can all do together. Our weekends in the mountains give us quality time together creating fun memories. Tweens are at the age where they are starting to want to spend more time with their friends and a little less with family activities. 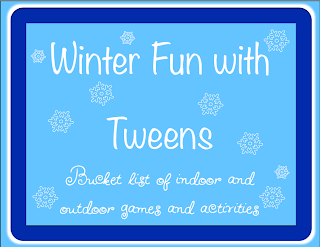 This winter we made a bucket list of fun activities both indoors and outdoors to keep the family fun during the winter. Many of these games and activities are also fun to do when they have friends over. This is a great bucket list to keep for an unexpected snow day from school. Many of these ideas came from various magazines and Pinterest. They are all pinned with the original links on my Winter Pinterest Board. Best wishes for a fun & creative winter!